This broad strip of gently shelving white sand is not only Turkey’s longest beach, but is also its most beautiful. 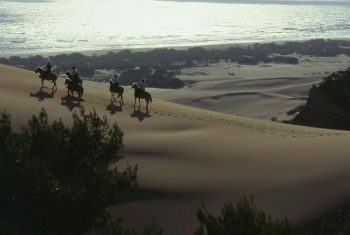 Children love its warm shallows, the succession of body –surfable waves and the serried ranks of dunes at the back of the beach. Development at its beautiful south-eastern end has been kept confined to one very reasonably priced beach café with umbrellas and sun beds for hire, reached through the romantic remains of a Roman city, preserved in the shifting sands. The low key Hotel Patara Viewpoint, run by Muzaffer and Anne Louise, is set around a pool on a quite leafy hillside, behind the ruins. 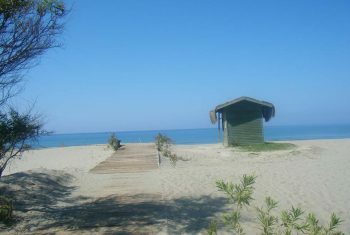 They have been providing a friendly service for visitors to this unique spot in south-west Turkey for more than 20 years – a service that includes free rides to and from the beach and an optional weekly barbecue. The Hotel Patara Viewpoint, in Gelemis, Turkey, is a Patara hotel offering rustic charm, lovely views and simply furnished bedrooms. Mainly couples and families seeking a relaxing base to explore this beautiful region’s atmospheric ancient sites, walk sections of the superb Lycian Way coastal trail, or lounge on one of the Mediterranean’s longest, least crowded beaches. Perched on a hillside and surrounded by olive, pomegranate, walnut and fig trees, The Viewpoint has wonderful views towards the sandy curve of Patara beach and sea beyond. Gelemiş village centre, with its smattering of low-key restaurants and bars, is a short walk away, the romantic dune-set Roman ruins of Patara and its eponymous beach not much further. 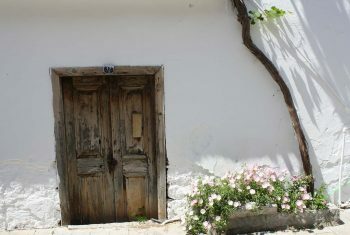 In keeping with the tranquil rural location, the emphasis is on a simple yet refined rustic charm. There’s a shady terrace set-out in traditional Turkish fashion, with low cushions to relax, read or chat with fellow-guests, a beautifully landscaped swimming pool area plus a comfy reception room complete with its own mini-library. The friendly and knowledgeable owners, Anne-Louise, who is English, and Muzaffer, who is Turkish, have been running the Patara Viewpoint for over twenty years now, and really know how to please their guests. The fact they also have their own travel agency ensures guests make the best of the things to do in the local area. The en-suite rooms here are not over-large, but are simply yet elegantly decorated, with crisp white bed linen and tiled floors decked-out with tasteful flat-weave rugs. Guests can cool their room with either a ceiling fan or the air-conditioner, and each of the 27 rooms has its own little balcony. Breakfast is a la Turca, which means lashings of delicious cheeses, olives, fresh breads, home-made jams, yoghurt, fried fruits, eggs et al – plus standbys like muesli. Much of the produce is from the hotel’s garden and greenhouse. Poolside meze (Turkish starters) and sandwiches are available during the day, and each Monday there’s an informal BBQ and each Friday a Turkish evening on offer. For the quality of accommodation this is excellent value for money. Doubles are £40 per night in April, May and October, a shade more June through September. There are discounts for bookings of a week or more. Closed November-March. Access for guests with disabilities – None. All you need is a little plot of paradise. We’ve scoured the world to bring you 25 breathtaking holidays – and all for under £1000 for two. 11. Fantastic hotels really don’t have to cost a fortune- and the hotel Patara Viewpoint ıs a case in point. On a hillside above the village of Patara, surrounded by lemon, orange, apricot and fig trees, it looks out to Turkey’s Turquoise coast. 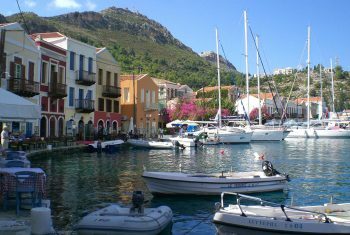 Two thousand years ago the village was one of the most important ports in the area, now the old city forms part of a protected area along the 15km golden beach where the turtles come to nest. From here you can travel up into the Taurus mountains or take a moonlight cruise along the coast. A great spot for evening drinks is the Ottoman terrace,warmed by burning cedarwood – and you must try the unique tractor trailer which takes guests to the beach. 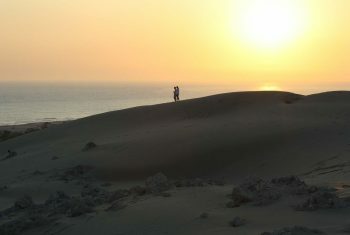 Visit www.pataraviewpoint.com or call +090 242 8435184. Turquoise Delight – Patara, Turkey: it’s got one of the longest beaches in the Med, Roman ruins and a wonderful hotel that won’t break the bank. I glanced down and saw a baby tortoise crawling past my toes. His shell was a murky green and his tiny head no larger than my little finger. I picked him up, whereupon he stretched out his head, eyes open, and peed. I put him down and turned once more to the scene I’d left behind. The sun, low in the sky, was throwing striped shadows across the broken columns of Patara’s Roman amphitheatre. Scores of local schoolchildren, transfixed in the stone seats, listened to an archaeology professor spinning them stories of the city in which they sat: Xanthos – whose terrible massacres, wars, glory and heroism have been described by Homer, Herodotus and Plutarch. Patara is a small village on the south-west Aegean coast of Turkey, known as the Turquoise Coast, and is famous for having one of the longest beaches in the Mediterranean. Its 18km of sand provides plenty of raw material for armies of children to build metropoli of sandcastles, as well as a nesting place for turtles, which between June and August emerge at night to lay their eggs in the sands. Patara is said to be the birthplace of Apollo and, when the Roman empire was at its height, it was one of the most important harbours in the western Mediterranean, sheltering ships from all over the ancient world. You can still find the remains of merchants’ bath-houses, their roofs open to the skies. Fallen Porphyry columns lie beside the largest avenue that the Romans ever built. Most atmospheric of all, though, is Patara’s Roman amphitheatre. Once it seated 10,000 citizens, now half of it lies buried under an enormous sand dune. Shelley could have had this place in mind when he wrote his famous sonnet, Ozymandias – “Round the decay/Of that colossal wreck, boundless and bare/The lone and level sands stretch far away”. In 1992, when tourism was just beginning to make its mark on Patara, the Turkish government slapped a preservation order on the town to protect the ruins. The locals were furious, and one miscreant hotel builder (his creation is the only scar on the wooded horizon) has been sent to prison for building without permission. But for the visitor, it is a godsend that this peaceful refuge cannot be developed further. 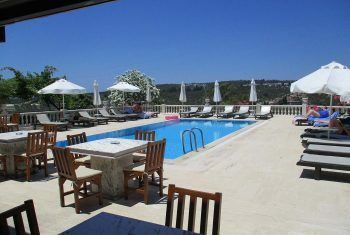 The most wonderful thing about Patara – ruins, turtles and beach aside – is the Viewpoint Hotel, owned by Muzaffer Otlu. Despite sounding like a B&B in Eastbourne, the Viewpoint is a very special place. This is not because of the accommodation, although the rooms are perfectly adequate; nor because of the amazing food, but because of the years of toil and thought that have gone into it. The tables, bar, flooring – even the ashtrays – have been fashioned from the same white-and-black marble quarried in central Anatolia, according to Muzaffer’s personal specification. Behind the two-storey building is a terraced orchard, planted with lemon, orange, fig and apricot trees. “Eat as much as you like,” says Muzaffer. But the Viewpoint’s pièce de résistance is its Ottoman terrace, roofed in bamboo, the sides open to the stars. In the evenings, guests recline on the low cushions – in one hand an aperitif made from Turkish almonds, in the other a pair of backgammon dice. The sweet smell of burning cedarwood wafts across the terrace. I spent every evening out here listening to the crickets. Muzaffer also runs tours. One day, we set off for a boat trip along the coast, stopping on the way to see the tomb of St Nicholas. That’s right – Santa Claus, otherwise known as Lapland’s most famous son, who was born in Patara and spent much of his life as a bishop in Myra. We boarded a wooden boat with a sundeck roof. From the sea, the Taurus mountains looked like the backs of dinosaurs; the dark, blue ridges curving into the water one after another, so that there were 10 horizons visible at once. We passed pirate hide-outs – caves formed by centuries of waves lapping on limestone outcrops – and stopped in a secluded bay to dive into the cool, clear, aquamarine water. The captain cooked a barbeque on the beach. Then we set off for Kekova island. In the 5th century BC, before the water level rose, there was a thriving city here. Stairways, foundations of houses and the arch of a temple are still visible still under the sea. On another trip, winding up into the Taurus foothills, we came upon the Saklikent gorge, through which a river flows down to a sun-filled plain. Walking down a footpath above the rushing torrent, you come to a shady clearing, and from the feet of the cliffs, as if from the rocks themselves, splurges of spring water gush over boulders to join the river. Enterprising locals have built bamboo platforms a foot above the torrent, upholstered in cushions of Turkish carpet. I lay upon one, splashing the icy water on my face, watching the kingfishers play mating games in the fig trees overhead. What a place for a midnight encounter, in August, when the figs are ripe. Turkish Airlines (020-7766 9300) offers return flights from Heathrow to Dalaman via Istanbul for £323pp inc tax/psc. British Airways flies to Istanbul for £197 plus £35 tax (Sat night stay required). The Viewpoint Hotel (0242 843 5184, www.pataraviewpoint.com) costs £10 per night per person. Loggerhead turtles have impeccable taste when choosing their breeding grounds. This is perhaps the loveliest beach in Turkey, if not the Mediterranean: mile after mile of white sand, fringed with the sort of clear sapphire water most British resorts would kill for. The presence of nesting turtles has ring-fenced the area from developers and water sports are banned. Emerging like the statue of Ozymandias from the sandy dunes behind the beach are the ruins of the eponymous Lycian city – not just a few dusty columns, but a Roman baths complex, theatre, monumental gate and temple; this was, after all, home of the temple and oracle of Apollo. The only drawbacks are sole-burning sand and a lack of shade. You can hire umbrellas, though, and a couple of snack bars sell cold drinks and ice creams. Don’t be put off by the cluster of bodies around the boardwalk access point; the crowds soon peter out as you walk west. Insect repellent is an essential. Staying put The Patara View Point hotel (00 90 242 843 5184, www.pataraviewpoint.com), set on a hillside just above Patara village (aka Gelemis), is simple but friendly and inexpensive with good food, fans and mosquito nets; double room with breakfast from £22 a night.